Campgrounds abound in Trinity County — whether they are established camps near the lakes and rivers, private campgrounds with amenities, or a flat open area in the wilderness overlooking an alpine lake. Many of the developed campgrounds have campground hosts who will help make your stay pleasant and answer any questions you may have. In the Trinity Center (North Trinity) area, there’s a KOA Campground. The only free campground is Rush Creek Campground, which is on Hwy 3 north out of Weaverville (as you head toward Trinity Lake). The Shasta-Trinity and Six Rivers National Forests offer beautiful camping areas that reflect the diversity of the forest landscape, ranging widely from low to high elevation, lakeside to forested and primitive to developed. Most developed campgrounds have piped water, tables, and stoves. Some have flush toilets, but most have vault toilets. Showers, electric hookups, and RV dump services are not available at most Forest Service campgrounds. Group campgrounds have many of the same features offered at Forest Service family campgrounds, but have larger tables, fire pits, and grills. Your group is assured exclusive use of the group camp. Reservations are available through the National Recreation Reservation Service (NRRS) or by calling 1-877-444-6777. Group camping is also available at Ruth Lake. At Trinity and Lewiston Lakes, most of the campgrounds are within the Shasta-Trinity National Recreation Area. The campgrounds are managed by the Shasta Recreation Company , concessionaire to the Forest Service. Dispersed camping is not allowed along Lewiston Lake. Camping around Ruth Lake is managed by the Ruth Lake Community Services District. Glamorous Camping (glamping) is now available at one of California’s most scenic settings, the Mary Smith Campground at Lewiston Lake in Shasta-Trinity National Forest. 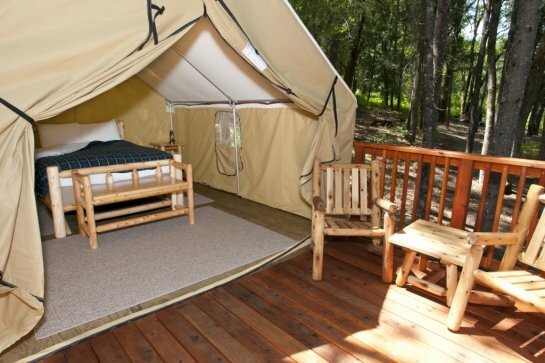 Glamping combines creature comforts with tent camping. Mary Smith Campground’s glamping tents are 168 square feet and come outfitted with a queen-sized bed with linens, feather down comforter and pillows, rustic peeled-log furniture (Blue Ridge armchairs, bed frame, boot bench, nightstands and café table), fire pit, picnic table and feature a private deck facing the lake — all for $65/night per campsite. Strawhouse Resorts in Big Bar along the Trinity River provides glamping in the form of a yurt. The yurt is outfitted with bamboo flooring, heating and air conditioning, an electric fireplace in the bedroom area, microwave oven, small refrigerator, coffee pot, toaster oven, clawfoot tub and shower, a queen bed, a large deck area. You have private river access located next to the Strawhouse Cafe’. Camping is not limited to developed camping. Almost all of your public forest is open to those who prefer the quiet solitude of a completely undeveloped setting. Chiseled granite peaks and alpine lakes dot the Trinity Alps Wilderness, with elevations from 2,000 feet in creek drainages to 9,000 feet at summits. The area contains the Wild and Scenic Trinity River in the south and the Wild and Scenic Salmon River in the north. Numerous rushing streams feed into these rivers, many of them emerging from the region’s 55 lakes. Also see the Trinity Alps Wilderness/Trail Report. Between the north and south Yolla Bolly Mountains are the rugged headwaters of the Middle Fork of the Eel River, all part of the Yolla Bolly-Middle Eel Wilderness. The wilderness ranges in elevation from 2,700 feet to 8,000 feet. A California Campfire Permit is required from May 1 until the end of fire season outside of all developed campgrounds. Campfire permits are required while operating a backpacking stove, camp stove, and gas lantern. During fire season, a free California Campfire Permit is required outside of developed campgrounds and can be obtained online (you have to watch a 2.5 minute safety video and take a quiz), at a US Forest Service (Shasta-Trinity stations; Six Rivers stations), Bureau of Land Management, or Cal Fire offices. Your campfire permit is valid from the date issued until the end of the calendar year; it may be used in any National Forest in California. A Wilderness permit is required for overnight stays in the Trinity Alps Wilderness, available at trailheads or any US Forest Service office. 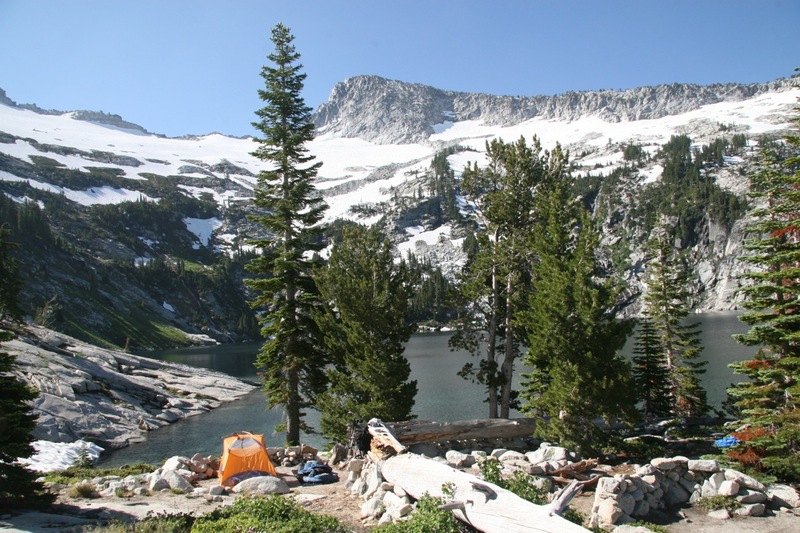 Your group size is limited to 10 people or less in the Trinity Alps Wilderness. You are limited to 14 days per campsite per year. No motorized and mechanized equipment, including carts. Do not cut trees. Bury human and pet waste at least 200 feet from camps, trails, and water sources. Do not build structures of any kind. Do not tie stock to trees. Camp or tether stock at least 200 feet from lakes and streams. At Trinity Lake, visitors can camp along the shore. Some areas may be restricted such as at bald eagle nesting sites, but even so there are miles of shoreline where camping is permitted. Dispersed camping is not permitted on Lewiston Lake, but there are many developed campgrounds available for you to enjoy this beautiful lake.